Ben got a model made by Midwest Products, the Chesapeake Bay Crabbing Skiff, for his birthday. 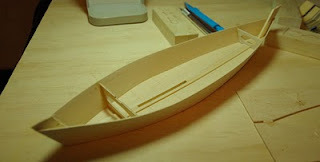 It is his first wood ship model. It was purchased at the Apponaug Color Shop in Warwick (a great hobby store). This seems to be a very good kit for him to learn on. We will chronicle the progress here on The Adventures of Ben and Pappa blog. 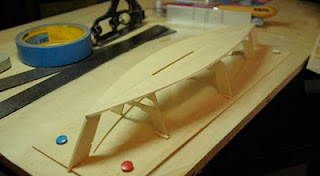 Work began with the construction of the building jig, the stem and stern posts and the bottom plank. At this stage progress went fast, we cut out the parts, sanded them and within an hour we were looking at the bottom plank perched on it building jig. The next step was to sand the edges of the bottom plank to accept the side planks. In the picture above Ben is 'finger clamping' the final side plank to the sternpost. Then the edges of the side planks had to be sanded flush with the bottom plank. We had made several small sanding blocks with varying grits of sandpaper before we began. Most of the tools we already had, and we are using regular old Super Glue as an adhesive. Once the sand was finished and we were satisfied with the fit of the side planks we then cut the skiff off the jig. This left the stem and stern posts way too long. They needed to be trimmed. The shot above was taken before we trimmed the posts, which we did but failed to take a picture of the hull trimmed. 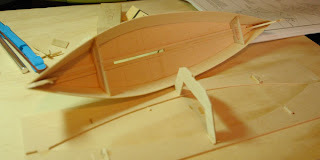 Ben then began work on the centerboard trunk. He cut with an X-acto knife and sanded all the necessary pieces and glued them together. And then the sanding began once again. The short video below shows some of the process. Ben and I enjoy model shipbuilding and this Midwest kit is the perfect first project for Ben. 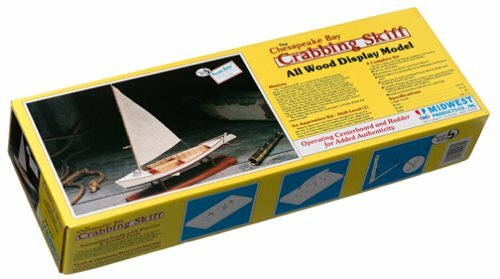 Next up we are going to model Lewis & Clarks keelboat Discovery. At least that is the plan right now... Ben wanted to start with Nelson's HMS Victory --- ambitious little bugger!